This is a machine for anyone with little space and budget, however within those constraints it has some interesting design features. 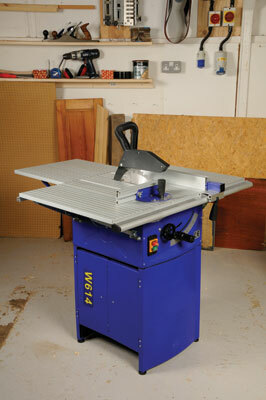 Assembly isn't stressful, the powder coated base is uniquely hinged so it unfolds and you simply sit the saw table on top. It isn't held in place by anything apart from the rubber feet so sawing long lengths could just upset the machine so in this instance a roller outfeed support is even more vital. 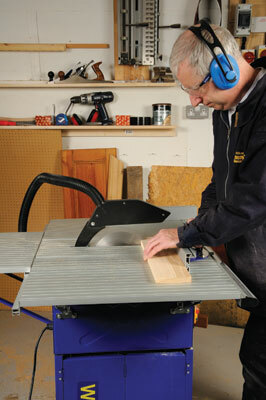 Speaking of which, the cabinet base has adjustable rubber coated fit so the saw can be wobble free in use. It is at its most compact when the flip up side table extensions are folded down and the rear extension not bolted in place, at approximately 660mm long by 550mm wide. The side table flick up and are latched in place very quickly although the rear extension would probably be left on normally to avoid being unbolted. The crown guard bolts on but is not the type that can be slipped off and on quickly for blade changing, although it doesn't take much longer to undo. The crown guard extraction hose simply pushes on to the guard and at the other end is fitted first to an elbow piece which then pushes onto the split outlet, one for below the table and the crown guard port. 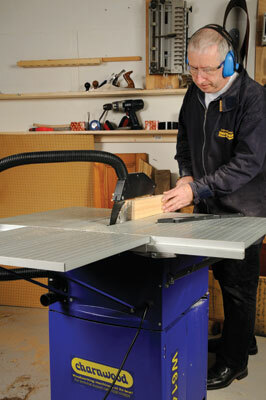 The elbow makes it easy to adjust the direction of the hose or make blade changing easier. 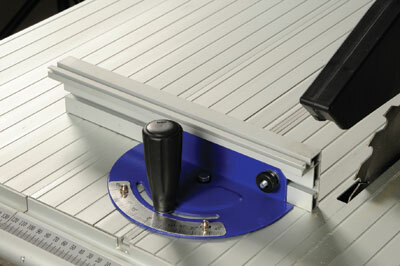 All the controls are located on the front, a standard rubber booted on and off switch and to the right the blade rise and fall and the tilt arbor control and lock knob. I found tightening this knob a bit difficult as some force was required to ensure the saw unit didn't start tilting unexpectedly. The fence is a good design, not overly long but rigid and has an adjustable subfence to optimise it either for sawing manmade board or for solid timber. It has a clear plastic adjustable pointer which sets against a very neat metric scale. A simple push down lever locks the fence in position, there being no fine adjustment mechanism. The mitre fence runs in one of two tracks in the anodised aluminium table but does so with a slight degree of sloppiness which won't help accuracy. It can be adjusted to any of the usual angle settings. The W614 has a direct drive brush motor like a powertool, this means the motor noise was 'bright' but ear defenders are essential anyway. It also means that under a heavy cut the motor is likely to slow down quite easily because there is no pulley drive using different size pulleys to increase torque. The standard rip blade as supplied can cut through the maximum depth of softwood at 70mm without difficulty so long as the feed rate is slowed a little. The same test on American White Oak caused noticeable slowing of the motor and resultant burnt, cut faces and blade marking. This effect may be due to a thin blade that flexes easily and/ or the motor arbor may have a slight wobble. In crosscut mode the mitre fence runs easily and gives a quick cut but again the cut is marred slightly by the blade scraping as it the wood runs past it. In all cases the extraction works pretty well. This is an entry level machine make no mistake. However it is nicely made and well put together. 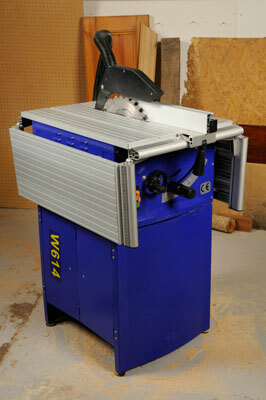 It is let down by how much demand you put on the blade when cutting thick material and the resultant cut finish. However it takes up very little space and delivers a result competently, especially for the price. "The motor noise was bright but ear defenders are essential anyway"